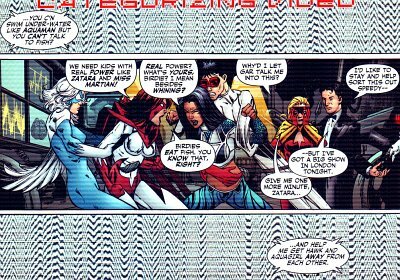 In Teen Titans #34, the first One Year Later issue, we get a single panel of Lorena as Aquagirl, arguing with Hawk. It's impossible to say when this panel took place, but it must have happened sometime in the missing year. Hawk: "...you c'n swim under-water like Aquaman but you can't talk to fish? We need kids with real power like Zatara and Miss Martian!" Lorena: "Real power? What's yours birdie? I mean besides whining?" Hawk: "Birdies eat fish. You know that, right?" If you want to read the rest, go buy the book.